The Japanese Denon, a brand of the D&M company, is mostly known from home theatre devices and gear for DJs. The company has taken this course by itself and keeps it consistently, and one must confess, that it fares well in the taken area. But its heart beats a different beat, what can be seen for example looking at the cartridges. Those are offered by Denon uninterruptedly since the deep analog era, and they are splendid. For me the most interesting case is the model DL-103, tested some time ago (HERE). Let’s remind, that this is a MC cartridge, designed in 1962! And it is a cartridge, that can compete with every competition in its price range. I use it for years, and for me it is an absolute master in some aspects in the 1000zl price range, and a reference point in the 2000zl range. This is a design with a spherical diamond – which is despised by many audiophiles – and with a significant load – 2.5g – parameters, which have been improved long ago. But some things must be added to this picture, like low compliance, what designates this cartridge to heavier tonearms. All of this composes in a unique mix of assets and flaws, which is very difficult to beat. 1962: the official birth date for the DL-103 cartridge. 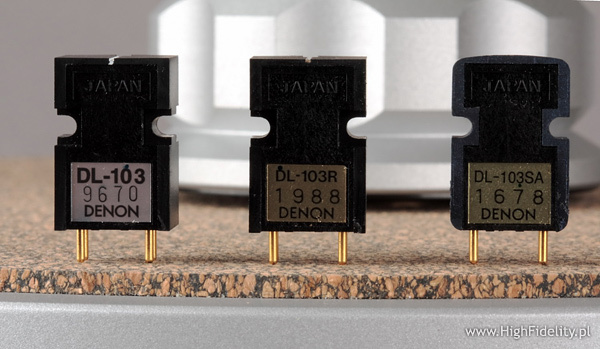 It is worth noticing, that the beginnings of the cartridge known today as DL-103, reaches times from before Denon and Nippon Columbia split. The research was conducted earlier, together with the reach part of the television company NHK, and were ended in the year the two companies merged. 1977: DL 103D – best model of the 70-ties. 1978: DL 103T – DL 103 with a matching transformer. 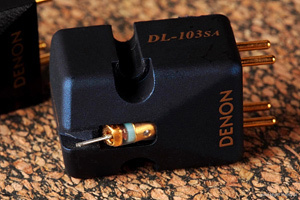 1981: DL 103U – DL 103 mounted in Denon headshell. 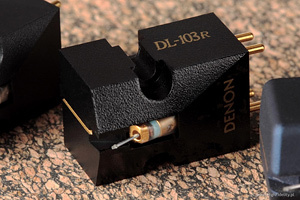 1982: DL 103 Gold – gold version of the standard DL-103 – manufactured on 20. Anniversary of the cartridge. 1983: DL 103M – light, aluminum body. 1985: DL 103LC/1986: DL 103LC II – coils wound with LCOFC copper. 1989: DL 103SL (Special) – 6N 99,9999 Pure Copper, special, white body. 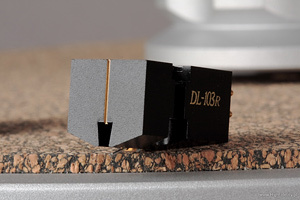 1990: DL 103GL (Gold Limited) – special, black body, 0.25mV, 40Ω output, spherical diamond, 5cu, VTF 2.5 +/- 0.3g, coil 4N High Purity Gold Wire 99.99%, limited production. 1991: DL 103C1 – cewka LCOFC, coil, special black body. 1993: DL 103FL (Fan Limited) – special white body. 1994: DL 103R – specification like DL 103SL (Special), but in a standard black body. 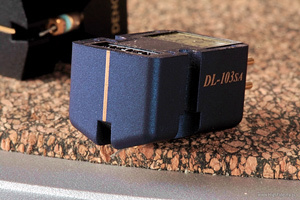 Denon cartridges are quite heavy products with low compliance. This means they fit better with heavy tonearms, also with long ones. Because at the same time I had a possibility to listen to a turntable from Pro-Ject with a 12” tonearm, Avid Volvere SME 309 tonearm, and Kuzma Reference with a mighty 12.5” tonearm, I can confirm that. This does not mean that the light arms are not to be used, but with heavier arms the Japanese cartridges can show their full potential. The differences between the tested cartridges are more qualitative than quantitative, and in absolute categories are not big. On the other hand, the character of those changes are key for proper reproduction of music, so every step up, from the DL-103 to the ‘R’ and ‘SA’ was something, that was completely outside the typical audiophile jargon of the ‘amount’ of – bass, treble, depth, scene, etc. And it is not even about ‘magic’, a not very precise descriptor, but describing the emotional aspect of music reception, but just about capturing the listener by a better illusion of a live event. As the Denon are quite heavy cartridges, with quite big load and low compliance, I tested them with a variety of tonearms – the light Jelco Oil S-Shape with a 10.5” length, heavy but short SME V and long and heavy 12cc EVO Pro-Ject. I repeat: the Japanese cartridges sounded better with longer tonearms, but only the SME could manage their bass and dynamics in the upper midrange. The sound of this “family” is shaped in the direction of melodiousness, continuity and coherence. We should also not forget about splendid dynamics in the macro scale. Their flaws, shared within the family, but less pronounced with each model “up”, are: not fully opened resolution, slightly limited size of the stage and lack of “openness” in the sound. The model ‘R’ is far from the basic model. I will tell the same when we go to the ‘SA’, but I cannot help it – the Japanese give us more “sound” for more money. Although I use the DL-103 for many comparisons and tests since over four years, it does not stop to amaze me, how such an inexpensive design could avoid the traps set for low-cost cartridges. But changing it to ‘R’ shows, that it is possible to advance on the same base. The timbre changes a little, but it does not matter here. There is a bit more bass, treble is stronger as well as upper midrange, which is responsible for vividness and a kind of “substantiality”, what translates to mass. But more important is that the sound resolution is vastly improved. This was the Achilles heel of the basic model, and in broader aspect, of all spherical diamond cartridges. Here you can hear immediately that the voices are better separated, the stage is deeper and more vivid, and this all not at the expense of rounding off anything. This was shown greatly by the disc with the Haendel’s oratorio Messiah, just issued by Linn Records – the difference was profound, although only some depth was added “here” and some resolution “there”. The latter turned out to be key, when listening to less complicated music from the Sara K. disc – her voice is not recorded well and with the basic model you cannot listen to this disc loud, because the upper midrange is annoying at high volume levels. With the DL-103R it was much better – the harshness I talked about remained (it disappears only with the ‘SA’), but everything was better balanced now. Benny Carter, Jazz Giant, Stereo Records/Analogue Productions, S7028, 45 rpm, #0404, 2 x 180 g.
Miles Davis, Miles Davis And The Modern Jazz Giants, Prestige/Analogue Productions, 7150, 45 rpm, #0706, 2 x 180 g.
Mari Nakamoto With Shoji Yokouchi Trio/Sextet, Mari, Three Blind Mice/Cisco Records, TBM-3005-45, 2 x 45 rpm, #0080/1000, 2 x 180 g LP; review HERE. Yama&Jiro’s Wave, Girl Talk, , Three Blind Mice/Cisco Records, TBM-2559-45, 2 x 45 rpm, #0080/1000, 2 x 180 g LP; review HERE. Andreas Vollenweider, Caverna Magica, CBS, 25 265, LP. Sara K., Water Falls, Stockfisch, SFR357.8025.1-1/2, 2 x 180 g LP; review HERE. Paul Desmond, Summertime, A&M Records/Speakers Corner Records, A&M 3015, 180 g LP. Eva Cassidy, Songbird, Blix Street Records/S&P Records, S&P-501, 180 g LP. G. F. Handel, Messiah, Linn Records, CKH 312, 3 x 180 g LP. Carol Kidd, Carol Kidd, Linn Records, AKH 297, 180 g LP (reedycja z 2007 roku). Greetje Kauffeld&The Paul Kuhn Quintet, Live in Weinheim, In+Out Records, Image HiFi 006, 180 g LP. The ‘103’ series cartridges have a big body – the ‘R’ version black, and the ‘SA’ version blue. Both have a spherical cut applied to the diamond. The main difference between the ‘R’ version and the basic one, are the coils wound much more precisely and with a 6N LC-OFC copper wire. The output voltage is very low, even for MC cartridges, 0.25mV. The tracking force is significant – 2.5g – but it is acceptable. Frequency response – 20Hz – 45kHz. The pins are gold plated. The ‘SA’ version is supplied in a nice mahogany box with a spare set of gold plated screws. The latter can be especially appreciated by users of the gold plated version of SME tonearms – extremely popular in Japan. Interestingly, many users claim, that the standard aluminum screws alter the sound in a different way than the gold plated, brass ones. This is even mentioned in the user’s manual for the DL-103SA. Its output level is a tad higher than the ‘R’, at 0.29mV (as stated on the attached leaflet), but still very low. But the main change is a different body – smaller, with rounded edges, made from glass fiber with resin. Only 2000 pieces of this model will be manufactured. With both cartridges a printout, with the frequency response curve of the given unit, is supplied.